"Dohee's imaginative work has placed her among the top students from art schools and programs across the nation," said Catharin Eure, chair of LCAD Design and Digital Media. "By training our students in advanced digital skills and visual problem solving, students like Dohee are empowered to be successful in the quickly-evolving new media industry." 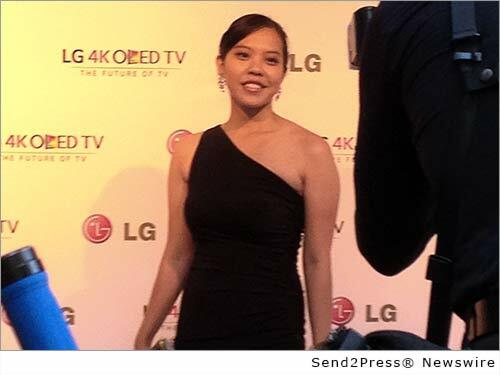 LAGUNA BEACH, Calif., Sept. 23, 2014 (SEND2PRESS NEWSWIRE) — Laguna College of Art and Design (LCAD) was chosen as one of the top design schools by LG Electronic USA to participate and final in “The Art of the Pixel: Powered by LG Ultra HD 4K and OLED TV” new-media art competition. LCAD Design and Digital Media program won $25,000 for the most popular votes. Senior student Dohee Yang was chosen as a finalist by Neil Patrick Harris and Digital Artist Mark Tribe at LG’s gala event in New York on September 17, 2014. Yang received $5000 for her piece, “Journey” which was selected from among 300 entries by students at nine of the nation’s best art schools. Celebrities at the gala event also included Kevin Spacey and Sarah Jessica Parker, along with LG dealers and executives and art community dignitaries to congratulate the nine contest finalists. In total, LG provided more than $250,000 in student and university awards. LG sponsored the competition to promote its new Ultra HD 4K OLED TVs. LCAD Graphic Design and Digital Media program encompasses print, advertising, web, 3D, motion, video, User Interface design and App development, package – and action sports design. More than 98 percent of recent graphic design graduates work in their chosen field, many finding employment before graduation. For more on The Art of the Pixel please visit http://www.lgusa.com/LGSupportsTheArts. Yang’s piece can be viewed at: http://www.lcad.edu/art-of-the-pixel/. Laguna College of Art and Design and Digital Media program offers a creative, digitally-advanced and professionally-relevant educational experience. All design students receive a comprehensive education in print, 3D, video, motion, and UI/UX design. The reputation of LCAD’s Design and Digital Media program has given graduates a competitive edge to gain employment with the world’s most recognized brands. Download a catalog, stay up-to-date on the latest news and events and support LCAD’s Annual Fund: http://www.lcad.edu/ or on Facebook at @LCADBFA, Twitter @LCAD and Instagram @lcadbfa. * VIDEO – Dohee Yang “Journey”: http://lge.23video.com/video/10046142/journey. * Photo Caption: LCAD Design + Digital Media Senior Dohee Yang finaled in The Art of the Pixel: Powered by LG Ultra HD 4K and OLED TV. Original Keywords: Dohee Yang, The Art of the Pixel, Design and Digital Media program, education, arts, Laguna Beach California Laguna College of Art and Design Laguna Beach California LAGUNA BEACH, Calif.
Laguna College of Art + Design (LCAD) has a location like no other, in a beachside community that lives and breathes creativity — Laguna Beach, California. Our extensive foundation programs provide the most thorough preparation for excellence in your chosen field. Our curricula make best use of the latest technologies and upgrades in computer hardware and software. And our dedicated faculty and small student-to-teacher class ratio combine to create an intimate educational environment designed for each student’s success. REFERENCES: California Business News, Dohee Yang, The Art of the Pixel, Design and Digital Media program, education, arts, Laguna Beach California Laguna College of Art and Design Laguna Beach California LAGUNA BEACH, Calif.